I have been eyeing a Franklin Christoph pen for a long long time ever since I spied the Franklin Christoph Model 40P in Ice and Fire on Instagram. Late last year, I was happy to learn that Fook Hing became Franklin Christoph’s authorised retailer. I began my research into Franklin Christoph pens and I set my heart on Model 66 and I waited impatiently for its arrival in Singapore. Once it arrived, it was only a quick trip down to Fook Hing and the pen is safely in my clutches. Franklin Christoph Model 66 came in a textured black box. It is long and features snap cover. Inside, the Franklin Christoph logo is embossed on the top half of the box. The lower half is dominated by the pen itself. It is a simple box that didn’t feel that much thought has been put to it. I figure it served its purpose of protecting the pen before the pen finds a home. The Model 66 is a long pen. It was longer than I had expected and it definitely didn’t fit in my Nock Co Lookout. That’s to be expected since the Model 66 is designed to be a desk pen. It is the production version of what was Franklin Christoph tester pens that allows buyers to test the various nib options that Franklin Christoph offers during pen shows. The pen is round with one flat side to prevent the pen from rolling off the table. 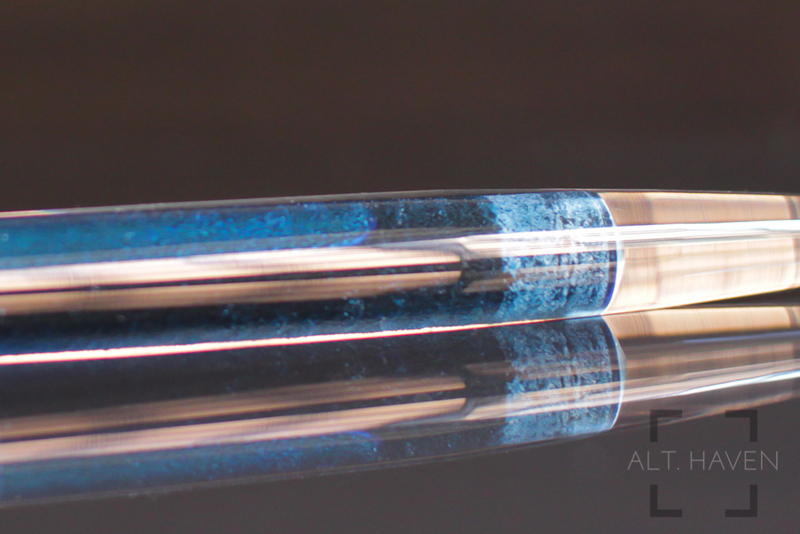 Under the flat side, the words “Franklin Christoph Model 66” is engraved on the barrel. The engraving isn’t too prominent but it can be felt when I ran my finger over it. The pen is a long smooth elongated cigar shape which tapers gently towards both ends. The Model 66 is a desk pen so it doesn’t come with a clip. The cap screws off easily with less than a single turn. For most part of the cap it sports the ice finish that is associated with Franklin Christoph pens except for the finial. There is a small clear section which carries the Franklin Christoph logo. The cap can be posted onto the end of the barrel. It posts rather deeply and it doesn’t throw the balance of the pen. One interesting thing about the Model 66 is the special block threads is located at the nib end of the grip section. Usually threads that connects the cap to the barrel are located near where the step is between the barrel and the grip section. For most types of grip, you should not even touch the threads at all. The threads are broad and smooth. With my grip, I don’t even come near to touching them. The grip section is polished acrylic with a slight step between the barrel and the grip section. Do note that though the step between is very slight, it is sharp and tends to bite my fingers. It really depends on how you hold the pen. The grip section doesn’t have any grooves to help with the grip but I never found it got too slick to lose my hold on the pen on longer writing sessions. 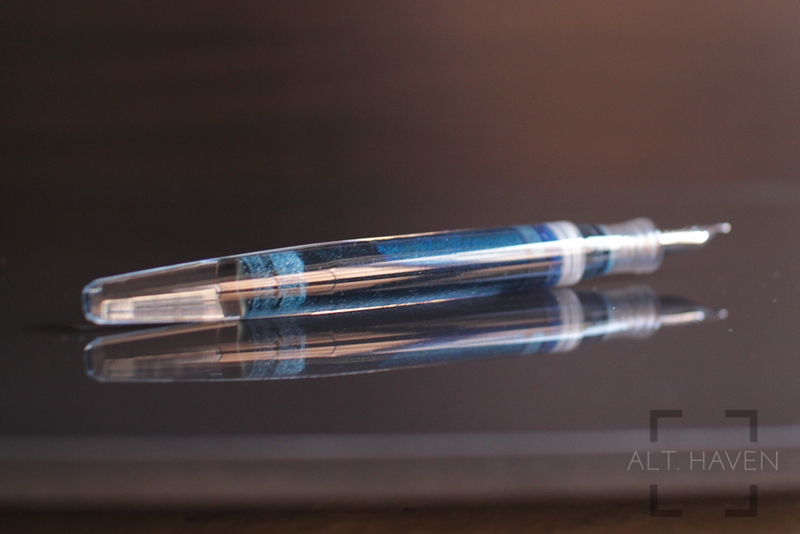 Though the Model 66 is a large pen but because it is made of acrylic, it doesn’t feel overly heavy to me. The pen is well balanced whether the cap is posted on or not. The Model 66 takes standard international converter and cartridge. It comes with a standard international converter in the box too. 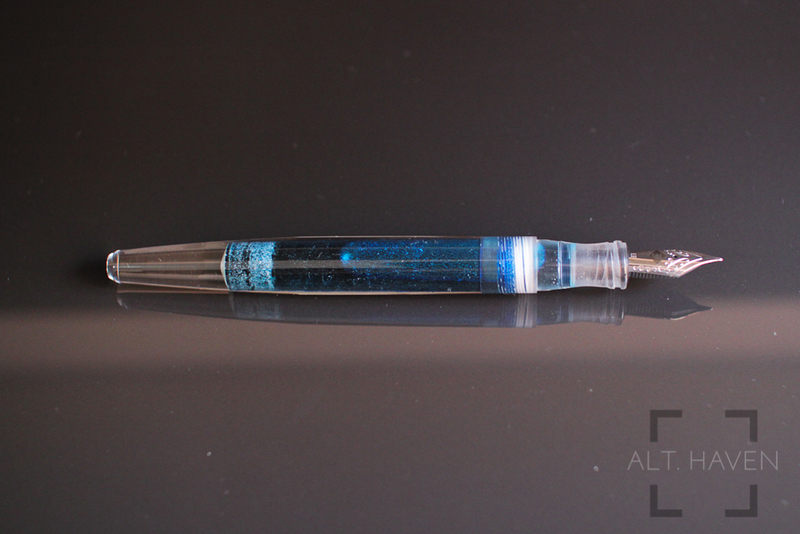 However, my attraction to the pen is how it looks when the pen is used as an eyedropper. If you do not know what an eyedropper pen is, it is basically using the body of the pen as the ink holding mechanism as opposed to a cartridge or converter. I didn’t hesitate to fill the pen up as an eyedropper. I didn’t measure exactly how much the pen barrel was able to hold but rest assured it is a lot. Filling it as an eyedropper definitely turned up the cool factor for the pen for me. However, staining it would be a very legitimate concern. I had initially filled with Akkerman Treves - Turquoise most of the ink came out easily with flushing. The only part where I had trouble is where ink got stuck between the nib and the inside of the grip section. However the nib section can be unscrewed for easy cleaning. To be safe, I would avoid highly staining inks. I went with the extra fine stainless steel nib for the Model 66. However, there are many other nib options for Franklin Christoph pens. In addition to the regular EF - B, 1.1mm and 1.5mm nibs in stainless steel and gold options as well as a 1.9mm nib in steel, you can get Mike Masuyama’s customs grinds. Mike Masuyama of Mike It Work is a well known nibmeister based in the US. What’s even better is the #6 nib on the Model 66 can be swapped with a number of other #6 nibs. Check out Gourmet Pens’ page for more information on that. 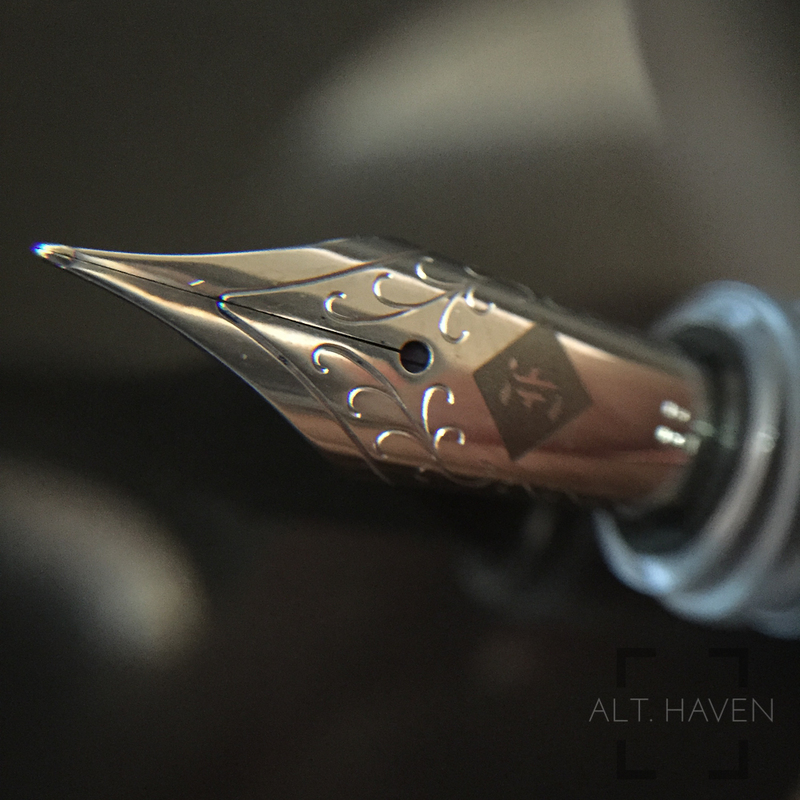 My EF nib is a smooth writer and it wrote even better after it was tuned to my hand. It writes as stiff as a nail and offers no line variations but I wasn’t expecting any since it is a stainless steel nib. I had tried bringing the pen out to one of Singapore’s local pen meet. The Franklin Christoph Model 66 didn’t take too kindly to beinging transported on my motorbike. Ink pretty much splattered inside the cap and was all over the grip section. I didn’t hold this against the pen for this since it wasn’t designed to be transported around that way. As a desk pen I am really happy with my purchase. The large ink capacity really capped off a great work horse pen for me. I really enjoy the ice finish on the Franklin Christoph Model 66. It is one eye catching pen.